Northern Ireland U21 international Aaron McEneff has signed a 18 month deal with Derry City. Derry City have signed midfielder Aaron McEneff on a 18 month deal. The 20-year-old, who was released by Premier League side Tottenham Hotspur this summer, maybe involved in tomorrow night’s squad. 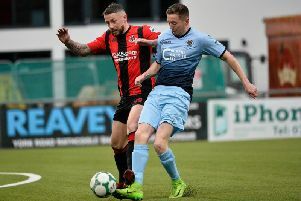 The ex-Institute and Maiden City Soccer man is Peter Hutton’s fourth signing this month. “Aaron ticks all the boxes, he’s a young talented player, who can play in a number of positions and I’m delighted to have got him,” said Hutton.